When it comes to shopping for Christmas gifts for Mom and Dad, it can be so difficult to find special gifts that truly demonstrate just how much they mean to us. If you are searching for gifts that not only bring sentiment to your Christmas celebration, but that are as one of a kind as your mom or dad, check out what we’ve found. Light up the memories of your childhood with a Unique Custom Photo Lamp this Christmas. This romantic lamp from Light Affection is certain to make your sweetie’s heart glow. An astonishing depiction of your loved one’ favorite pet photo, this personalized lamp is truly one of a kind. This unique lamp is one of our favorite Christmas gifts for Mom and Dad, and is certain to carve some joy into your holiday celebration. This one of a kind night light is a wonderful conversation starter on those cool winter nights. Mom will adore this depiction of some of her finest memories with this breathtaking lamp this Christmas. When it comes to Christmas gifts for Mom and Dad, this magnificent photo lamp is hard to beat. If you’re not sure which photograph to choose, or you don’t have access to Mom and Dad’s photos, this gift certificate is the perfect solution. Remind dad of the wonderful childhood memories you shared with this personalized lamp created especially for him. This unique desktop lamp is the perfect addition to Mom or Dad’s home office. A breathtaking portrayal of the Eiffel Tower photograph taken by Tony Florez, this limited edition piece is certain to impress. This mysterious lamp is certain to bewilder that inquisitive dad on your list this holiday season. Mom will be astonished when she realizes that there is no actual photograph inside. 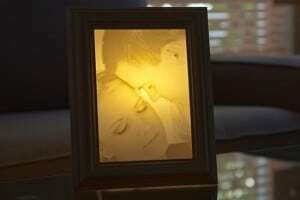 Created to replicate your favorite photo, this personal photo lamp is truly one of a kind. Make those memories last forever with this personalized lamp from Light Affection. Have you ever seen lamps that are so breathtaking? These beautiful lamps created by Light Affection are some of the most unique Christmas gifts for Mom and Dad that you will ever find. 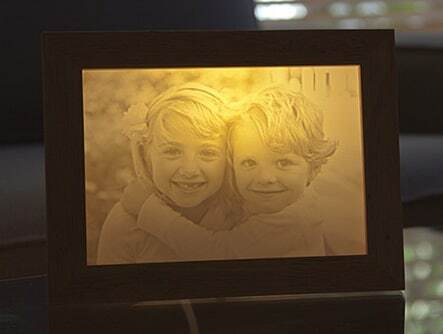 The experts at Light Affection use innovative a technique that was inspired by the age old Greek art of Lithophanes in order to bring your most treasured photographs to light. Please be assured that your original cherished photo is merely used as inspiration in the creation of your piece, and will be returned to you undamaged.